This is the story of David Sohappy, a native American spiritual leader who was sentenced to a five-year prison term for selling 317 salmon out of season. For twenty years Sohappy has fished in open defiance of state and federal fishing laws. He claims he has an ancestral right to fish along Oregon’s Columbia River. As a result, he has become a symbol of resistance for indigenous people of the Northwest United States and beyond. River People explores the historic conflict over the resources of the Columbia and the political controversy involving fishing rights and the right to religious freedom. Sponsored by: Augsburg College Native American Film Series, Upper Sioux Community, Independent Indigenous Film Minneapolis, Shakopee Mdewakanton Sioux Community, Dean’s Office, Center for Teaching and Learning-Project Development Grant, American Indian Studies, Augsburg Historical Society, Film Program, English Department, Deb Redmond, Women’s Resource Center, Women’s Studies, American Indian Student Services and the Augsburg Student Activities Council. Thunderbird Woman is an inspiring portrait of Winona LaDuke, member of the Anishinaabe tribe from the White Earth reservation in Minnesota. The film introduces you to this remarkable woman’s activism, which includes organizing against uranium and coal mining on reservation land, raising money to buy back land originally owned by Native Americans, and founding the Honor the Earth Foundation. She was chosen by Ralph Nadar to be his running mate on the Green Party ticket in the 1996 and 2000 elections. Sponsored by: Upper Sioux Community, Honor the Earth Foundation, Augsburg College Native American Film Series, Independent Indigenous Film Minneapolis, Shakopee Mdewakanton Sioux Community, Dean’s Office, Center for Teaching and Learning-Project Development Grant, American Indian Studies, Augsburg Historical Society, Film Program, English Department, Deb Redmond, Women’s Resource Center, Women’s Studies, American Indian Student Services and the Augsburg Student Activities Council. Radioactive Reservations takes viewers on a tour of four reservations that have battled with the United States government against placing Monitored Storage Retrieval sites (radioactive waste dumps) on their lands. Tribal leader Ron Eagleye Jonny to the Piute Shoshone reservation in Nevada, the Skull Valley Cosiute reservation outside of Salt Lake City, and to Navajo, Apache, and Puelbo communities in New Mexico and Nevada where tribal people tell of their struggles against nuclear fallout from weapons testing. Jonny also visits a power plant in Minnesota where conversation is monitored by lawyers and public relations people. The U. S. and Canadian governments have had a long history of assimilation practices through missionary and governmental boarding schools and through adoption practices that take Native children away from their tribal communities and place them in non-Native families for a variety of reasons. Whose Child is This? looks at several families where adults have been repatriated back into their tribal communities and the complicated process of re-establishing Native ties. Katrina at 16 months was adopted by a loving Scottish family which returned with her to Scotland. As she grew up, she felt increasingly alienated from the white society that surrounded her. Now a mother of a four-year-old, she returns to Alert Bay to find her roots. In Idaho a young Lakota boy is being claimed by his biological father. The white adoptive parents fear the trauma of separation could be devastating. These are just some of the stories told in this award winning film. Following the screening local adoptees who will share their experiences growing up outside their cultures and then finding their way back. Sponsored by: Upper Sioux Community, Augsburg College Native American Film Series, Independent Indigenous Film Minneapolis, Shakopee Mdewakanton Sioux Community, Dean’s Office, Center for Teaching and Learning-Project Development Grant, American Indian Studies, Augsburg Historical Society, Film Program, English Department, Deb Redmond, Women’s Resource Center, Women’s Studies, American Indian Student Services and the Augsburg Student Activities Council. Lady Warriors is the compelling story of seven Native American teenage girls who are Arizona State cross-country running champions, in training for another championship competition. They believe that establishing outstanding reputations as runners will enhance their chances of getting scholarships to college. The film takes place on the Navajo and Hopi reservations in and around Tuba City, Arizona and on the road—as the women prepare for their fourth consecutive state championship competition. The following three events will be held at The Center for Independent Artists. April 22: New Voices in Native Media Part I— Emerging works by Native American and Latino filmmakers. Sponsored by: Upper Sioux Community, Augsburg College Native American Film Series, Independent Indigenous Film Minneapolis, the Center for Independent Artists, In Progress, and Shakopee Mdewakanton Sioux Community, American Indian Student Services and the Augsburg Student Activities Council. April 29 New Voices in Native Media Part II & Native Lens — Emerging works by Native American and Latino filmmakers. 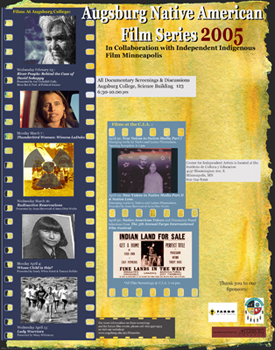 Sponsored by: Upper Sioux Community, Augsburg College Film Series, Independent Indigenous Film Minneapolis, the Center for Independent Artists, In Progress, and Shakopee Mdewakanton Sioux Community, American Indian Student Services and the Augsburg Student Activities Council. Sponsored by: Upper Sioux Community, Augsburg College Film Series, Independent Indigenous Film Minneapolis, the Center for Independent Artists, Fargo International Film Festival, and Shakopee Mdewakanton Sioux Community, American Indian Student Services and the Augsburg Student Activities Council.